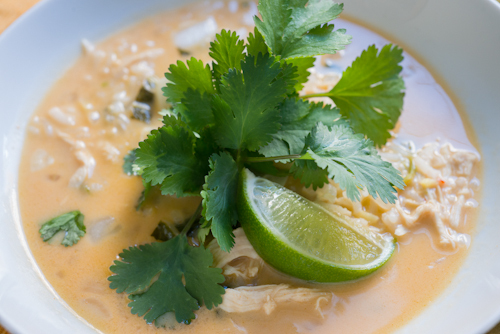 Here's a Thai-inspired chicken soup that is easy to make and bursting with flavor! It's healthy comfort food with an Asian twist. Heat a soup pot over medium high heat, then add the coconut oil. Saute the onions with a little salt for a few minutes, then add the chicken chunks with a little more salt. Cook, stirring frequently, until chicken is just cooked through. Add the ginger and half of the garlic towards the end of this. Stir in the broth and bring to a boil, then stir in the coconut milk, half of the lime juice, and the red pepper flakes. Reduce the heat to low and simmer covered for at least 15 minutes (longer is fine, too). Turn off the heat, and add salt to taste (depends on the amount in your chicken broth). Stir in the rest of the garlic, the scallions, and most of the cilantro (leave a little aside for topping individual bowls). Add the rest of the lime juice if desired. Cover and let sit off-heat for 5 to 10 minutes, then serve. Great served over rice. Add a few drops of fish sauce to your serving to knock the flavor out of the park! Mrs. Samurai I like your recipes that get posted. I do a lot of healthful & unhealthful cooking myself. I have a request of you. My daughter has been a vegetarian for several years. She recently has gone Vegan on me for reasons of animal rights. I was a vegetarian for a number of years in my early adulthood, and we eat meatless during certain times of the year for religious observations, but I am not a fan of the vegan diet, long-term. I think most people really need a small amount of good quality animal products in their diet. That being said, I understand not wanting to support the practice of the large-scale meat/egg/dairy production. We buy almost all of our meat and other animal products from small, local farmers. These animals have healthy, happy lives, and come to a more peaceful end than their counterparts in the wild! It's more expensive, so we just eat a little less. I'll keep an eye out for other recipes I can share with you! Haha - yeah, that reminds me of when Scott and I were first married, I was a vegetarian, and we had dinner at his Yiayia's (Greek grandmother's) house for the first time!